There are 17 places available on this tour. Bookings close on Wednesday 26 June unless sold out prior. Below is some general information about our Margaret River 2 Day Tours, please note that these rides are not for beginners, so an intermediate level of off-road riding experience is essential, advanced options will be offered along the way. Also, you will need to hold a current motorbike licence for your enduro bike (or learners permit for your class) and your bike must be ‘A’ class road registered, silenced, in good mechanical condition with either new or good off-road tyres fitted. Your bike will need a fuel range of 80kms. We need to meet at our base near Kirup at 8am with a view for the tour to depart at 9am (assume a 2.5 hour drive from Perth city or 45 mins from Bunbury). Cars and trailers can be left securely at our property. The tour usually arrives back at our base around 3:30 – 4pm on Sunday afternoon depending on rider ability and trail conditions etc. The tour will start by taking some flowing trails into the Blackwood Valley region with some hills, single trail in the pines and excellent scenery as we make our way to lunch near Nannup. The afternoon will take in some open trails and hard packed sandy trails through to Margaret River, this section is also the longest leg of the tour. We will have an extra afternoon refuel and short break half way though this section and we should arrive in Margaret River around 4:30 – 5pm. The evening is then yours to enjoy in Margaret River. Sunday morning breakfast is at 7:30am at the Motel. 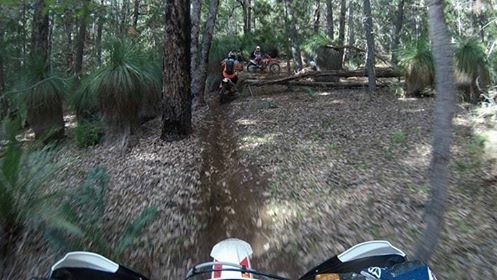 We will depart Margaret River around 9am and lead you back through open flowing trails into state forest and pines including creek crossings and erosion mounds. A camp lunch will be supplied at Barrabup Pool. The afternoon will take in open fire trails finishing at our base around 3:30 – 4pm. Cost of this Tour is $594 and includes: Light snacks for your backpack, lunch with drinks both days, accommodation (twin share) & Sunday morning breakfast at the Grange on Farrelly Motel, fuel after your first tank, full 4WD backup support plus experienced lead & sweep riders. Please note your evening meal is not included in the price, the town centre is only a short walk way for meal and pub choices for the evening.